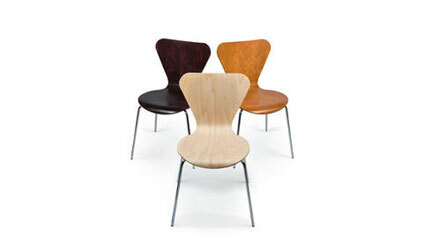 ART DESIGN INTERNATIONAL CLOVER STACKING CHAIRS | ADI | Alliance Interiors Inc. The CLOVER is stacking wood shell chair made of molded plywood on a four leg base with glides. The standard finish of the shell is natural maple with 5 optional stain colors. A 20 high stacking dolly is available. The visible metal portions of the frame are available in black, sandex black, chrome, brushed chrome, silver gray, dark grey, light grey or beige. A cushioned seat pad may be added as an option. I recommend the Clover stacking chair in coffee shops, cafeterias, restaurants and as Bistro seating. I use a combination of low seating and counter height seating to give a dimensional look to any hospitality or recreational area . The ADI Clover stacking chair can be used in a residential application for dining rooms or kitchen and the stool height adds a unique look to that bar or counter height area. I like using a few different finishes to add a unique look to the decor.